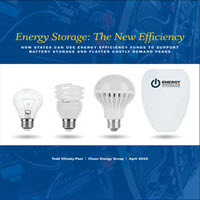 This report, which describes how states can use energy efficiency funds to provide incentives for energy storage, is a publication of Clean Energy Group (CEG), with appendices containing several white papers prepared by the Applied Economics Clinic under contract to CEG. This report explains the steps Massachusetts took to become the first state to integrate energy storage technologies into its energy efficiency plan, including actions to 1) expand the goals and definition of energy efficiency to include peak demand reduction, and 2) show that customer-sited battery storage can pass the required costeffectiveness test. The report also introduces seven non-energy benefits of batteries, and for the first time, assigns values to them. Finally, the report provides recommendations to other states for how to incentivize energy storage within their own energy efficiency plans. Four appendices provide detailed economics analysis, along with recommendations to Massachusetts on improving its demand reduction incentive program in future iterations of the energy efficiency plan.